Remember, remember the fifth of November 2016! Make sure you celebrate Bonfire Night in true style at one of these great London firework displays. Toffee apples are not optional! Take the family along for a night of musical entertainment and excellent fireworks display. There will also be loads to eat and drink and entertainment for all ages. The gates open at 6 pm and the fireworks display will kick off at 8:10 pm. Celebrate Bonfire Night by learning about the infamous Gunpowder Plot at the Royal Gunpowder Mills. There will be activities for the whole family, and the Ghost of Guy Fawkes play for children from 2 pm. The brilliant 15-minute firework display will cap off the event at 6:45 pm. This has been a favourite site for Bonfire Night for the past 150 years, and the tradition continues this year with two magnificent shows. There will be a slightly quieter event for children, followed by a louder and larger display for adults. There will also be a funfair, food stalls, and loads of fun to be had for all ages. The main display will take place at 8:30 pm and continue for 25 minutes. 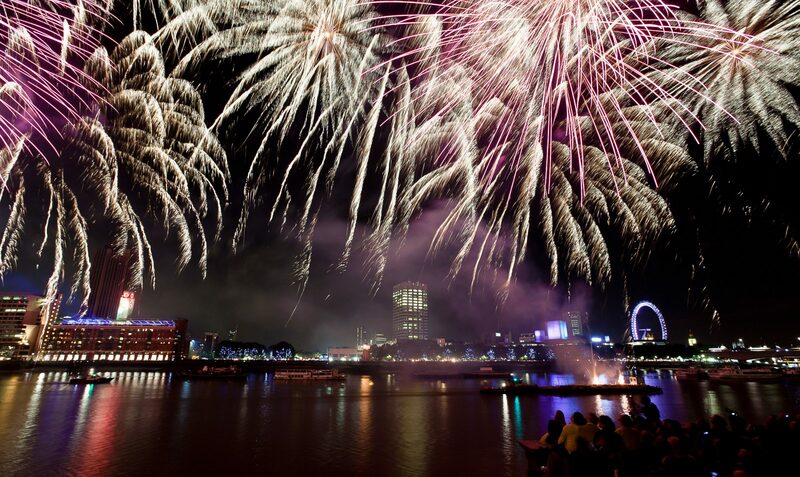 Head over to the East Village this Bonfire Night for a pyrotechnic extravaganza like no other. Over 500 fireworks will light up the sky, carefully choreographed to contemporary music. You can catch the display being set off from Victory Park. Before the main event, there will be the chance to buy food and drinks from a myriad of stalls. Be sure to book early for this one as it is particularly popular within the E20 borough. Another hugely popular venue for watching fireworks in the capital, the palace continued to illuminate the north London skies just three years ago after taking a break for about four years. Best of all, this year’s event is set to happen twice. There will be an impressive fireworks display complete with the sensational panoramic view of the city, entrance to the family zone, plenty of funfair rides, entertainment for young and old, a craft beer village, street food, and an adult funfair. If you enjoy your beer, be sure to add on a ticket to the German Bier Festival happening in the Great Hall from 3 pm. You’ll get to enjoy all the festivities of Oktoberfest and the bang of Bonfire Night. These are just some of the top places in the capital where you can see the skies light up on the 5th of November. What will you be doing? Tweet us @ultimateexp to let us know.